1st things 1st: You must send us your Product ID (and yes click there) to receive an Activation Key. More visually oriented? Watch the short Unlocking Editor tutorial instead. The official Studio Electronics SE-02 editor (Ver. 1.4) is once again the handiwork of SE Sound Designer and Coder, Emmanuel Santoul, developer of the software editors for the ATC, SE-1, and Omega Series synths. Thanks and appreciation go out to Keigo Minamiya at Roland Corporation for assisting in the development and implementation of this inspiring cross-platform product. Our Roland approved SE-02 standalone editor affords full, real-time control, providing not only an intuitive GUI, enabling immediate access to all synth parameters, but also full library management and auditioning, "Patch Blending," "Random Patch Generation," and edit and compare functionality. Expressive features not standard on your synthesizer can now be explored, integrated, and perhaps most importantly, visualized—to simplify, and yet amplify your most detailed '02 sound designs and creative expressions. In general, one can interact with the software in the same way you would with the front panel controls of this Boutique, but the seamless integration and coordination of the two closely interacting systems, real and virtual, massively increase the programmer’s grasp of the total signal, timbre, and control flow. Switch programs, tweak sound parameters, or move to another bank: editor and hardware and editor settings will correspond; a contextual menu, with all features available, will be displayed by right-clicking the display. Copying and pasting, and rearranging your patches—a bear with just the box and your DAW in front of you—is now gentle on the mind, perhaps even enjoyable. Better still: saving and reloading banks (all within a few minutes) without disconnecting, power recycling, and reconnecting, as well as transcending and expanding the single User bank limitations is reason enough to get on board. Note: The app does not generate sound, it only address MIDI and SysEx data. 1. Roland approved and supported editor. 2. Complete front panel implementation with expanded features. 4. Deep and detailed Patch and Bank exploration modification made easy. 5. Visual Patch edit and compare of all parameters. 6. Bank saving/loading without disconnecting, rebooting, and reconnecting. 7. Expressive MIDI Learn Random Patch Generator (Santoul version). 8. Patch Blending: morphs two patches into a new storable sound (Santoul version). 9. Crazy useful (and very French) random patch name generator. The plugin version: VST (2.4), AU, of the Editor is intended for DAW integration, and is a type of facilitator which allows easy access to automation. The plug-in provides a faithful representation of your synth’s front panel depending on the current patch/bank selection but does not provide a virtual extended panel allowing full review of bank catalog. Any sound parameter can be adjusted / automated, even hidden ones (a set of potentiometers have been added at the bottom of your synth’s representation). 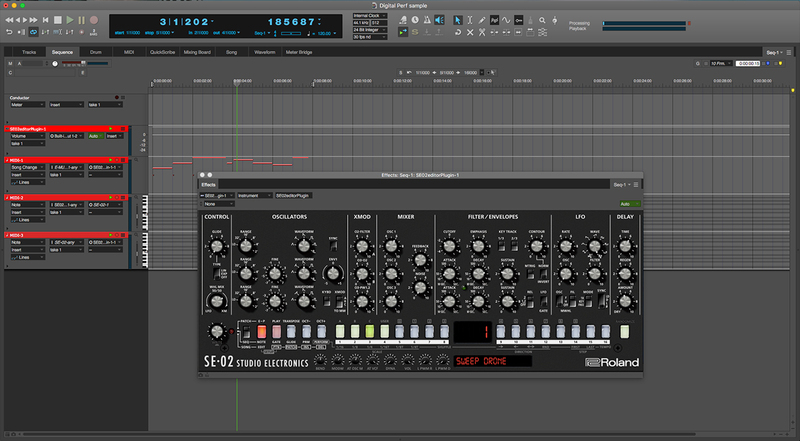 MIDI bi-directional dialog allows playing with both your synth and the plug-in. Any tweaks done on your SE-02 front panel are reflected real-time by the plug-in. Plug-In must be installed on the same PC as the Standalone Editor. 2. Complete front panel implementation. 4. All edits made in project are saved and reloaded with the project. 5. Patch change must be implemented via plug-ing and not the Value/Write knob—that works as a reset/refresh of the saved patch. Mac: OS X 10.7 (Lion) and higher, 64bits app; PC: Win7 and higher 32bits app. It's likely you will need to update your synth’s firmware. The minimum required version of the SE -02 firmware is 1.10. Get it here. As there is now an additional tune point at 82.4hz, which has to be incorportated, please run the auto-tune routine: Press and hold the TRANSPOSE button, then press the VALUE/WRITE encoder: EXIT will flash and the display will read "Start tuning P". Press encoder again. After the 3 line flasher show, it's done. SANTOUL Standalone V. 1.4: $12.99. 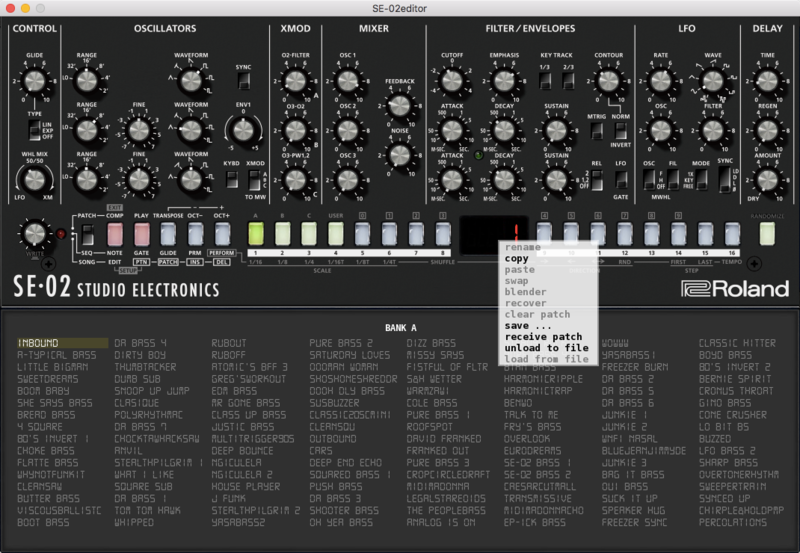 Includes Patch Blender and MIDI Learn/Random Patch Generator. VERSION 1.4 UPGRADES: Free with order #. VST / AU Plugin: $7.99. Basic or Standalone installation required. Once the customer's Product ID is submitted via email, an actual person (we're not Roland after all) will issue your Activation Key generally within minutes, but it can take longer, so we thank you in advance for your patience and grace under pressure. And of course it will be worth the wait—if there is one. The compressed PC and Mac file entension (.zip) is mysteriously deleted after downloading in some cases, so please add .zip back to the end of the file name if necessary, so the Editor can be properly identified and decompressed. Thx.